On February 21, 1997, the first of five children’s play centers known as Club Disney opened in Thousand Oaks, California. It was billed as an exploratory entertainment area for children aged between four and ten, along with their parents. There were four themed areas within Club Disney: Pal Around Playground, Curiosity Castle, Starring You Studio, and the Chat Hat. Activities for the kids ranged from dressing up in Disney costumes, to playing in an enormous jungle gym, to exploring the latest CD-ROM activities. One other club opened in California, as well as one in Colorado, and two in Arizona. After the five clubs were established, Disney Corporate determined that there was not enough return on investment, and closed all five clubs in November of 1999. The name now belongs to play areas established within Disney park resorts. Posted in Uncategorized and tagged 1990s, Child Actor, Educational, Interactive Attraction, Walt Disney Company. Bookmark the permalink. On February 20, 2000, the Downtown Disney restaurant Cap’n Jack’s Restaurant opened in Walt Disney World. Originally Captain Jack’s Oyster Bar, which served drinks and seafood appetizers since the marketplace’s opening in 1975, the restaurant expanded on the seafood theme, with tables facing the waterfront of the Downtown Disney area. The restaurant closed in August, 2013, due to the expansion of the Disney Springs project. Posted in Uncategorized and tagged 2000s, Closed, Disney Park, restaurant. Bookmark the permalink. 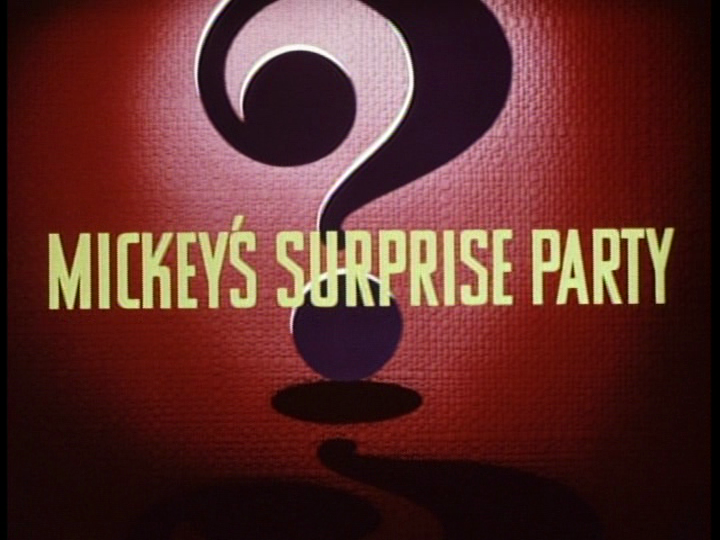 On February 18, 1939, the short film Mickey’s Surprise Party was delivered to Nabisco. It was created as a commercial for the biscuit company to be shown at the 1939 New York World’s Fair. It stars Minnie Mouse and her dog Fifi, with Mickey making an appearance near the end. Minnie is busy in the kitchen making cookies for Mickey, but when she puts down the bowl to grab an ingredient, a fly buzzes around the bowl. As Fifi tries to drive the fly away, she accidentally knocks over a box of popcorn, sending the contents into the mixing bowl. She hides as Minnie returns to finish making the cookies. Mickey arrives soon after, and Minnie quickly primps to receive her beau. Mickey gives her a bouquet of flowers, while Pluto gives Fifi a bone. When Mickey asks for his surprise, smoke starts to pour out of the oven; when Mickey notes that something is burning, Minnie races towards the kitchen, alarmed. She quickly pulls out the burnt cookies, which then promptly explode one by one, thanks to the popcorn in the batter. Minnie then sobs over her failed attempt to make cookies like Mickey’s mother made, but Mickey reassures her that his mother used to burn cookies all the time. He decides to solve the situation by running to the store and bringing back a slew of Nabisco products, including Ritz Crackers and Oreos, and Mickey’s favorite, Fig Newtons. Minnie is so thrilled with Mickey, she kisses him. Posted in Uncategorized and tagged 1930s, Color, Mickey Mouse, Minnie Mouse, Short film. Bookmark the permalink. 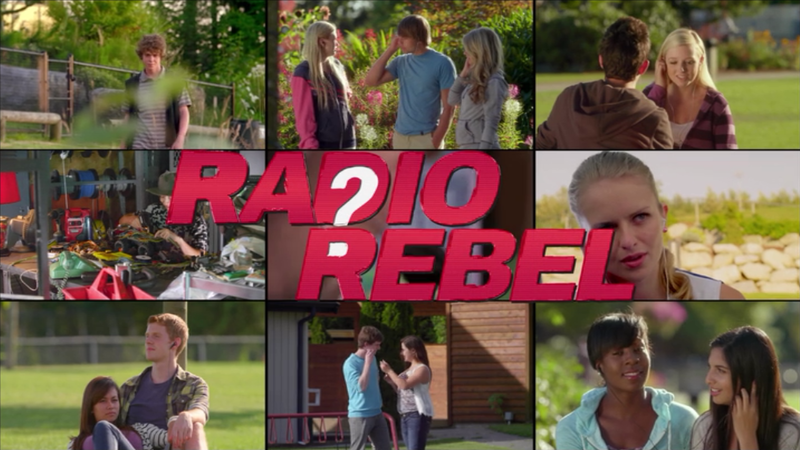 On February 17, 2012, the Disney Channel Original Movie Radio Rebel premiered. It was based on the book Shrinking Violet by Danielle Joseph, and garnered over 4 million viewers on its premiere night. It was written by Erik Patterson and Jessica Scott, and directed by Peter Howitt. The film stars Debby Ryan as Tara, Sarena Parmar as Audrey, Adam DiMarco as Gavin, Merritt Patterson as Stacy, and Mercedes de la Zerda as DJ Cami Q. At Lincoln Bay High School, the new episode of Radio Rebel is the talk of the students, with her take on rejecting the status quo. Shy student Tara wishes she could be more like the radio personality, but can’t even speak normally to her best friend Audrey. Audrey, however, is more than willing to take Radio Rebel’s words to heart, and tries to break the status quo by talking up to Queen Bee Stacy, although Stacy thinks that Radio Rebel is just a nuisance. Her point is proven by Principal Moreno, who automatically listens to the popular kids and not to Audrey and Tara when they are accused of something they didn’t do. Meanwhile, Stacy is flirting with Gavin, a member of the band The G’s, who will be playing at prom. Tara has a crush on Gavin, and when he shows up in her class, she runs out of the room to hide, but Audrey convinces her to come back to class. When picked by the teacher to write something on the board, the super shy Tara is unable to do anything and completely embarrasses herself. At home that day, Tara’s stepfather, who owns a radio station, is checking out the Radio Rebel podcast. He believes he should have Radio Rebel on his station, and he goes to ask Tara about it, when prompted by her mom. He tries to bond with her, but the situation is highly uncomfortable, especially when he finds out that she is Radio Rebel. He tells her that he wants her on his radio station before she has a chance to really process it. At school, Tara is placed in a group with Stacy and Gavin, and unsure of what to even say or do, although the two end up bonding over a shared love of bands. Later, as she talks to Audrey, she finds it hard to keep her friendship and her secret of being Radio Rebel. Later, Gavin stops by to talk to her about the project, but Tara is so shy she runs away. That evening, she heads to her stepfather’s radio station, and he wants to keep her identity secret. Unfortunately, her shyness keeps getting the best of her, and she’s not sure if she can handle it. DJ Cami Q, a worker at the station, calms her down and offers to be her best friend at the station. Finally, Tara sets up for her first show, and is able to tap into her Radio Rebel persona. She asks that students who hear and understand that they’re all in this together wear red the next day. The next day at school, the majority of the student body is wearing red, although Audrey is still angry that Tara ditched her, although seemed to find the time to listen to the show. Tara tries to explain to Audrey that she’s Radio Rebel, but Audrey doesn’t’ believe her. Tara then finally proves it to Audrey, and makes her promise never to tell. Tara continues to work on her school project, which is a scene from Shakespeare’s Twelfth Night, which mirrors Tara’s real unspoken crush on Gavin. Stacy, however, is continuously threatened by Gavin’s attention to Tara, but Gavin interrupts Stacy so Tara can be heard. 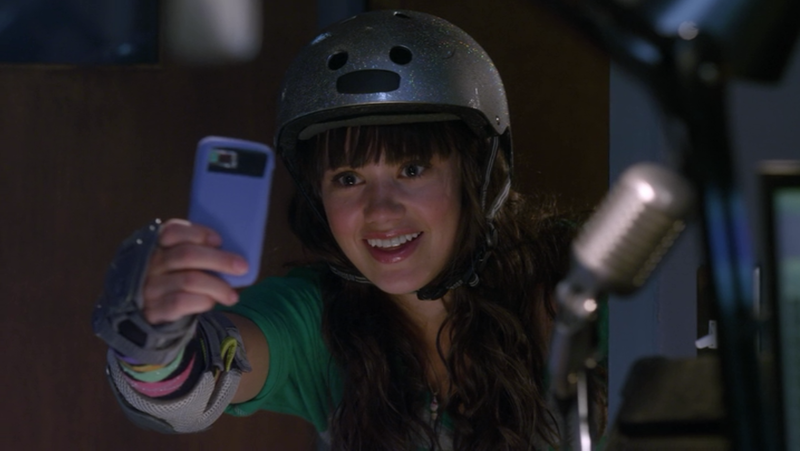 On the way out from practice, Tara spots Gavin’s band’s demo CD, and decides to play it on her show that night while making a statement about how the Principal keeps confiscating their items; she also asks the students of the school to dance at 8AM the next morning. Principal Moreno, unhappy with Radio Rebel’s antics, announces that Radio Rebel needs to turn herself in immediately. At lunch, Gavin pulls Tara aside, and makes it sound as though he knows Tara is Radio Rebel, but in the end, only knows that Tara gave Radio Rebel his band’s demo CD. Meanwhile, the search for the identity of Radio Rebel is at an all-time high around Seattle, and the marketing is all over, as her show has hit an all-time high in the charts. Tara then has an idea to play a show at lunch, having Cami DJ-ing at school. Principal Moreno appears to break up the show, but Cami not only is parked on city property, but also has a permit. Hearing that Principal Moreno wants to expel Radio Rebel, she decides to go on a mission to expose who she is, as she loathes the popular show. Meanwhile, Gavin wants his band to take risks and challenge themselves creatively, but his bandmates are not convinced, especially since best friend Gabe is all about the fans and popularity rather than creating meaningful music. At school, Audrey gives Tara the news that Radio Rebel is nominated for Prom Queen, and poor Tara panics, as she is supposed to remain anonymous. When she heads to her show, Tara’s stepfather warns her about Principal Moreno’s threat to expel Radio Rebel once her identity is revealed. Worried for her safety, he wants her to stop the show, but when she gives an impassioned plea, he lets her continue, believing in her. Her mother congratulates her for her Prom Queen nomination, and tells her that she doesn’t care what Principal Moreno says, as Tara inspires people. Finally, Principal Moreno plays dirty: unless Radio Rebel gives herself up, prom is cancelled. The students, led by Stacy, start a riot in front of the station, demanding that Radio Rebel give herself up. Tara gives her show that day, and people start screaming at her, as they say she crushed their dreams. However, Tara decides to do something different: the radio station is going to host a MORP, a prom spelled backwards, as they’ll be turning things around. Unfortunately for Tara, Stacy is starting to be suspicious that Tara is Radio Rebel, and threatens Tara: unless Tara shows up her party, Stacy will expose her. Tara manages to show up at Stacy’s party, and patches into her show to trick Stacy. Tara finally stands up to Stacy, much to the surprise of Audrey, but Stacy still wants to trick Tara into revealing her identity. Tara finally gets a chance to talk with Gavin, and the two connect, although their conversation is broken up by Gabe, who doesn’t think Gavin should be talking with Tara. Stacy’s henchman Kim sneaks into the radio station to get proof of Radio Rebel’s identity, and hears Cami and Tara’s mom discussing Tara and her show. The next day, during their class project presentations, Stacy locks Tara in the janitor’s closet. Gavin looks around for her, and gets in an argument with Gabe, which ends with Gavin quitting the band. Stacy plans on hijacking the scene with Gavin; when the janitor unlocks the door to get his supplies, Tara rushes to the stage for her scene, but arrives too late, seeing Stacy and Gavin together, and seeing Stacy kiss Gavin. Stacy threatens Tara: Tara better ensure that Stacy is MORP Queen, or she will give up Tara’s identity. Tara gives her show that night about standing up for yourself, and Audrey messages Gavin, telling him the truth about the assignment. 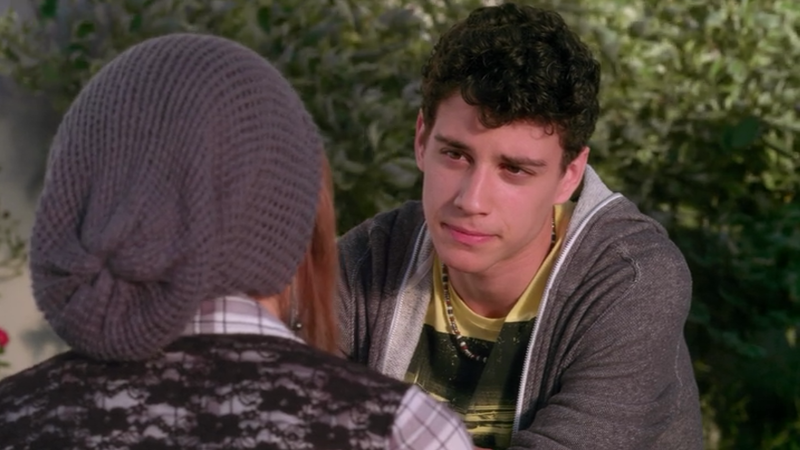 The next day at school, Gavin confronts Stacy, and tells her that they are no longer going to MORP together. At the MORP, everyone from Lincoln Bay High is having a great time, and Cami arrives on stage to announce who the MORP Queen is. Stacy is called to the stage, as is Radio Rebel, but Tara doesn’t move. Radio Rebel is announced as MORP Queen anyway, but Tara doesn’t come to the stage; however, she finally makes her way up, explaining why she has chosen to reveal herself. Principal Moreno is also in attendance, and declares that Tara is expelled. However, Audrey and Gavin cry out that they’re Radio Rebel, with the whole crowd following their example. Knowing that Moreno can’t expel everyone, Moreno gives up. Tara decides to give the crown to Stacy instead. Gavin then performs on stage, dedicating the song to Tara, who he has liked for a while. As he performs, Gabe and his friends join him on stage, realizing that they can make meaningful music as a group. As Tara and Gavin dance together later, he reveals that he’s known she’s Radio Rebel, but never said anything as she wanted to keep it a secret, and he respected that. Posted in Uncategorized and tagged 2010s, Color, Disney Channel, Disney Channel Original Movie, Live Action, Television. Bookmark the permalink. 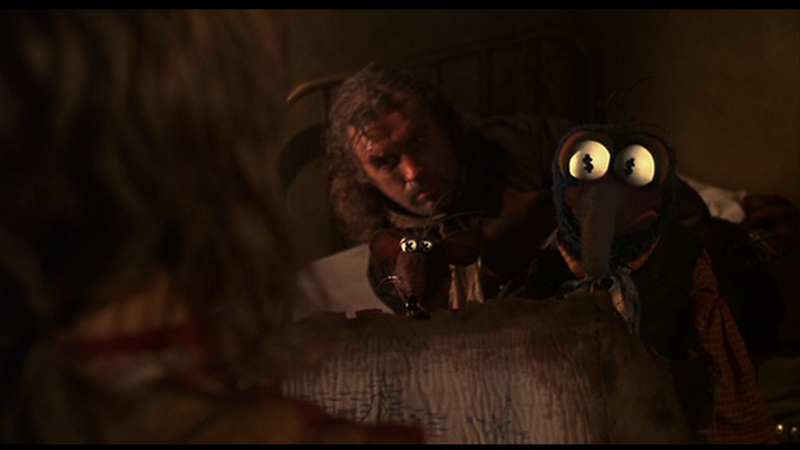 On February 16, 1996, the live-action feature film Muppet Treasure Island was released to theaters. 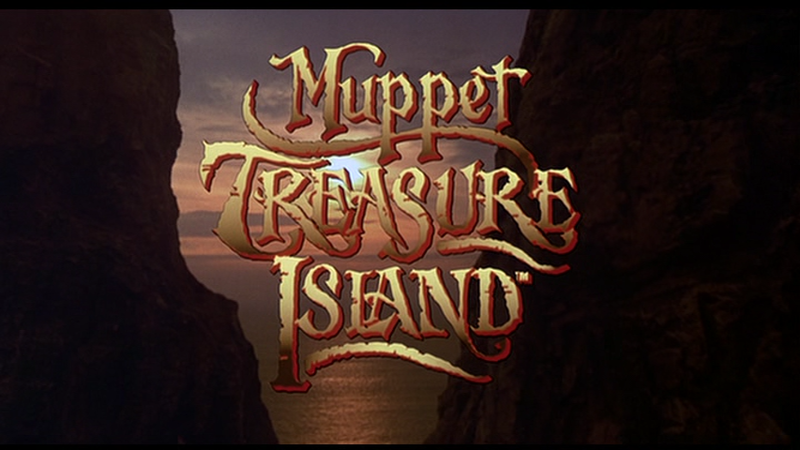 It was the fifth Muppet feature film, and the second collaboration with Disney (the first being Muppet Christmas Carol), and was based on the children’s novel Treasure Island by Robert Louis Stevenson. The film received positive reviews upon its release, but was not without some humorous controversy: the leader of the tribe is named Spa’am, which caused Hormel Foods to sue Jim Henson productions for using the name of their product, Spam. The suit was tossed after a three-day trial when Hormel was unable to come up with proof of damages, adding “In view of the more or less humorous takeoffs…one might think Hormel would welcome the association with a genuine source of pork.” The film was adapted by Jerry Juhl, Kirk R. Thatcher, and James V. Hart, and directed by Brian Henson. 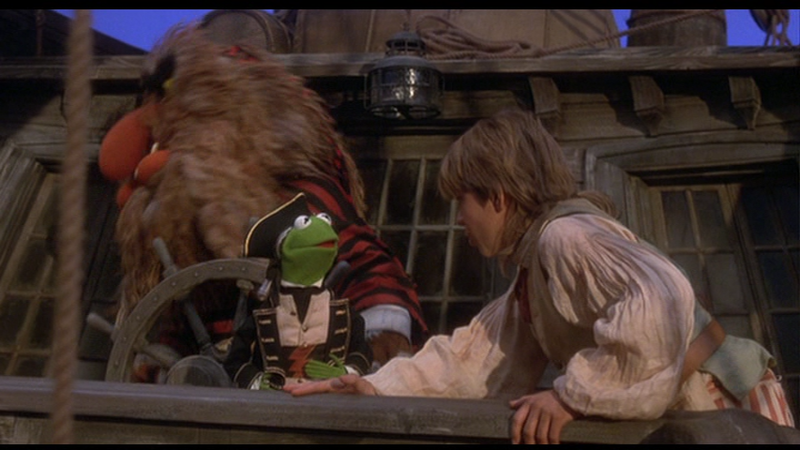 It stars Kevin Bishop as Jim Hawkins, Tim Curry as Long John Silver, and Billy Connolly as Billy Bones. The story begins with a retelling of the legend of Captain Flint burying his treasure on a faraway island, as told by Billy Bones for the umpteenth time. Everyone in the bar is tired of the story, save for Jim Hawkins, a young boy who serves drinks at the Admiral Benbow with his friends Rizzo and Gonzo. Bones jokes that Jim must have Flint’s missing map, but warns the three that they need to be wary of the one-legged man. Finally, it’s closing time at the inn, and proprietress Mrs. Bluberidge lectures the boys about forgetting to put out the lantern the other night. As the boys head to their chores, Jim relays his wish to run off to sea like his father did so many years ago, as he wants a life like Bones’ stories. As they clean up the inn, Bones heads back downstairs for some rum, when a blind stranger arrives at the door to deliver a message to Bones. Bones is horrified when he receives “The Black Spot,” a pirate’s death sentence. Bones panics and heads back his room, with the boys following him to try and calm him down. Bones reveals that he’s been the one who took Flint’s map, and that the pirates are coming after him for it. Knowing he’s dying, he gives the map to Jim before he dies from the stress, but not before he warns him once more of the one-legged man. Not a moment afterwards, the inn is invaded by the pirates, who chase the residents of the inn looking for the map. Rizzo and Gonzo accidentally set off an explosion in the basement near the gunpowder, and in the confusion, Jim, Rizzo, and Gonzo are able to escape while Mrs. Bluberidge is able to fight off the pirates. Having nowhere else to go, the boys decide to go after the treasure after acquiring a ship in London. Their first stop is Squire Trelawney’s to get a ship; while Squire Trelawney is unavailable, his rich, half-wit son Young Squire Trelawney is available, and the boys meet with him. Trelawney is willing to provide a ship for the expedition, thanks to Mr. Bimbo, “the man who lives in his finger,” and is even more excited when he hears about the pirates after the treasure. The day of the voyage, Trelawney points them to the Hispaniola, their ship for the voyage. Accompanied by Dr. Livesey and his assistant Beaker, the boys board and set out to explore the ship. They head to the kitchen, where they meet the cook, Long John Silver. Jim is taken with Long John, until he finds that he only has one leg. 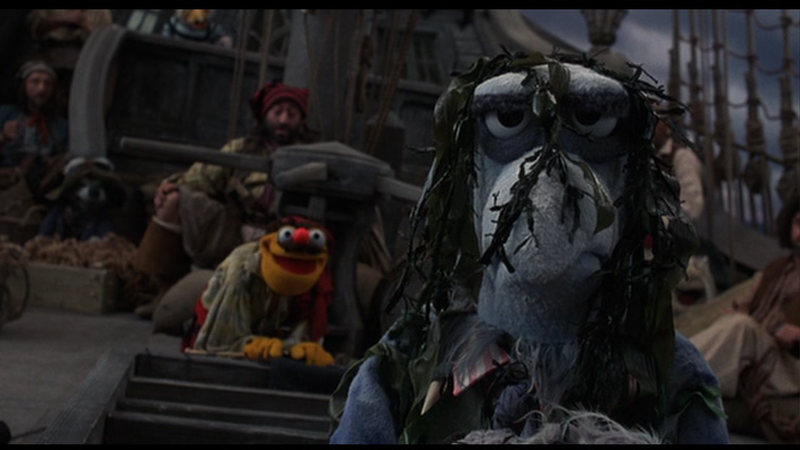 Gonzo reminds him of Bones’ warning, but Jim thinks that Long John is harmless, as he’s only the ship’s cook. The bell rings for the arrival of the Captain, and the crew is ordered around by his overly strict first mate, Mr. Arrow. Captain Smollett arrives, and the crew realizes that he’s not the “raging volcano” that Mr. Arrow made him out to be. Soon, the ship takes off, with everyone on board in good spirits (especially Rizzo, who has turned this voyage into a profitable cruise). However, when the first roll call occurs, Smollett’s good mood vanishes, as he is highly concerned about the reliability of the crew, as he believes them to be scoundrels and cutthroats. He calls Mr. Arrow, Jim, Rizzo, Gonzo, Livesey, Beaker, and Trelawney into his cabin and demands to know who hired the crew. When Trelawney admits that Mr. Bimbo did thanks to the advice of Long John Silver, Smollett turns his concerns to Jim, asking for the treasure map for safekeeping, although Jim refuses. No sooner does Jim refuse that Long John arrives with a special treat of brandy for the group, but Smollett is firm that there will be no drinking on this voyage. Jim heads off with Long John, leaving Rizzo and Gonzo by themselves. That evening, Long John teaches Jim how to sail by the stars, but nearly throws Jim’s compass over the railing as a joke, although gives it back when Jim reveals that it’s the only thing he has left of his father. The two bond over their shared experiences, although Long John tries to get the truth out of Jim as to where they’re sailing. As the journey continues, Jim spends more time with Long John, and Gonzo and Rizzo are kidnapped by a few members of the crew and are tortured for the whereabouts of the treasure map. The plot is uncovered by Mr. Arrow, who locks them up for the rest of the voyage. After this incident, Smollett orders that Jim give him the map for protection, and Jim reluctantly complies. Mr. Arrow locks up the map and keeps the keys with him. The voyage continues, until the ship hits a point where there’s no breeze, leaving them stuck in the middle of the ocean with no hope, but plenty of cabin fever. The wind finally picks up, and Long John heads down to the brig to see his shipmates, although acts like he’s ashamed of them in front of Jim. Jim lets slip that there is a treasure map, and that Mr. Arrow took it and locked it up. That night, Long John tricks Mr. Arrow into testing one of the lifeboats, as he tells the safety-conscious first mate that the crew could drown in leaky lifeboats; Mr. Arrow hands Long John his keys for safekeeping as he casts off. The next morning, the crew tells Smollett that Mr. Arrow fell overboard, and a saddened Smollett holds a small ceremony while Long John’s crewmates unlock themselves with Mr. Arrow’s keys and steal the treasure map from Smollett’s safe. As Jim cleans, he finds Gonzo and Rizzo in an apple barrel, and they pull him in. As they’re inside, they finally hear Long John’s true intentions: taking the treasure for himself and staging a mutiny against Smollett. The ship finally arrives at its destination, and the boys warn Smollett of Long John’s plan. Smollett orders that Long John takes the crew ashore to get provisions, confusing the boys, but Smollett then asks the boys to bring the officers to his cabin. Long John is suspicious of Smollett’s orders, and kidnaps Jim, taking him ashore with the rest of the crew. Meanwhile, in his cabin, Smollett lays out his plan to leave once the pirates are ashore and return in a year – a plan that is now a failure since Long John has Jim. To save Jim, Smollett, Gonzo, and Rizzo head ashore. On shore, Long John tries to convince Jim to join his crew, but Jim refuses, as he wants nothing to do with pirates. Jim has no choice but to accompany the pirates as they search for the treasure, with Long John taking his compass. Smollett, Gonzo, and Rizzo arrive on land that evening and make camp for the night, but are soon captured by the natives of the island, and are brought before the Queen of the tribe, Boom Shakalaka, otherwise known as Benjamina Gunn, Smollett’s fiancé that he left at the altar. The meeting between Benjamina and Smollett does not go well. Jim leads the pirates to the treasure, but the treasure is already gone by the time they’ve arrived. Angered, the pirates plan on attacking Long John, and Long John saves Jim, telling him to run. Jim makes a getaway, while Long John is left to defend himself. He makes his way to the tribe’s camp, and rescues Gonzo and Rizzo, with the three of them running off to get help as Smollett is called before Benjamina Meanwhile, the pirates give Long John the Black Spot, but he manages to finesse his way out of the situation and take control of the men again, ordering them to seek out the treasure again. Jim, Gonzo, and Rizzo find their lifeboat, which has been destroyed by the tribe. While they think what to do, they find Mr. Arrow rowing the lifeboat, and they use him to get back to the ship. As Benjamina yells at Smollett for abandoning her at the altar, and tells him that she ran off with Captain Flint, who marooned her on the very island. Smollett and Benjamina’s reunion is interrupted by Long John (another one of Benjamina’s former dalliances), who demands to know where the treasure is. Jim manages to sneak back onto the Hispaniola and save the officers, and they use the pirates’ superstition against them, as they have Mr. Arrow pretend to be a ghost to scare them all off the ship. Jim then commands the ship and they head to the island to rescue Smollett. The pirates hang Smollett by his feet over a cliff, with Long John threatening to kill him unless Benjamina gives up the treasure’s location. Benjamina gives in, but they hang her up as well. Benjamina and Smollett share a moment together before the fire nearby burns through the rope, sending them flying to the rocks below. Fortunately, the Hispaniola arrives just in time to save them, as they land in the arms of the figureheads Statler and Waldorf. The pirates head back to shore with the treasure, and think that the ship is haunted, as they see no one on board, with Long John knowing that Jim is the one behind this. The ship crashes into the shore, and pirates quickly engage in battle with Jim and his friends, with the pirates soon being overrun. Smollett takes on Long John, but as it looks like Smollett will lose, Jim steps in to protect him; Gonzo steps in to protect Jim, with Trelawney stepping in to protect Gonzo, until Benajmina arrives with her tribe to stop Long John once and for all. 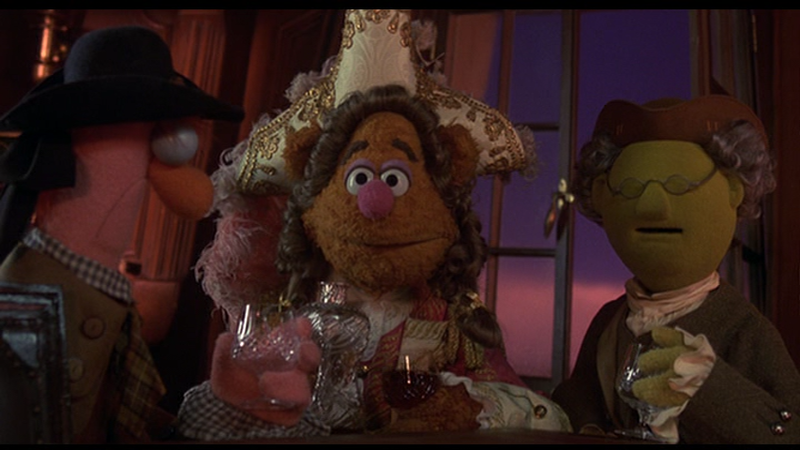 Posted in Uncategorized and tagged 1990s, Color, Feature Film, Live Action, Muppets. Bookmark the permalink. 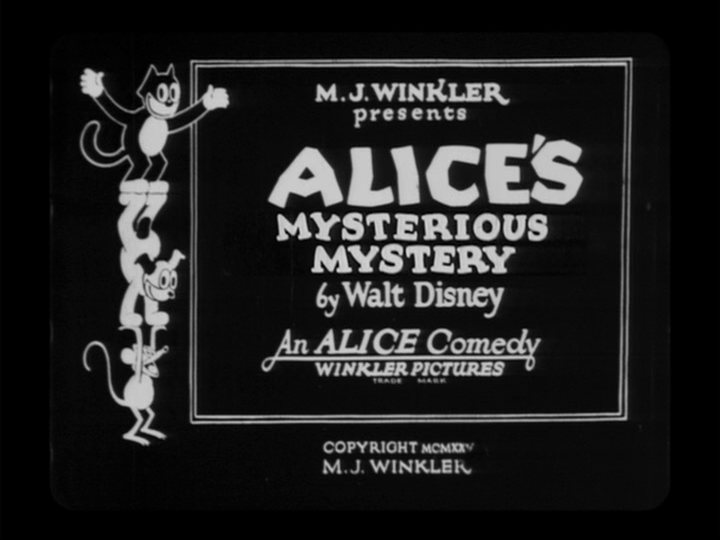 On February 15, 1926, the Alice Comedy Alice’s Mysterious Mystery was released to theaters. It was the 31st Alice Comedy released by Disney, and stars Margie Gay as Alice. The short can be seen as controversial, as the villains are dressed as Klansmen (fortunately, the villains are defeated in the end). In the cartoon world, a bear smoking a cigar is making his way is his chauffeured car when he comes across the school for puppies. He plots with his chauffer to pretend to be a dog catcher and trucks them all inside before taking the school and placing them inside his dog catcher truck. No sooner has the event occurred that Alice and Julius are on the case, tracking the footprints, which only leads to a dead end of a duck wearing shoes. They hear a cry for help from a dog that is soon captured, and Alice and Julius begin the pursuit. The bear manages to carefully get across a tightrope to the other side of the cliff, but as Alice and Julius make their way across, the bear uses his cigar to burn up the tightrope, leaving the detectives stranded. Having made a clean getaway, the bear uses a new tactic to capture dogs: luring them to an inconspicuous trap door with a pretty female dog standing at her balcony as bait. It is soon revealed that the dogs are being placed in the sausage factory in separate crates, with workers turning the dogs into sausages. Alice and Julius finally make it to the factory, with Julius tricking the bear into falling through the trap door. Julius manages to let the dogs go free, and they all chase the bear and other workers out of town.